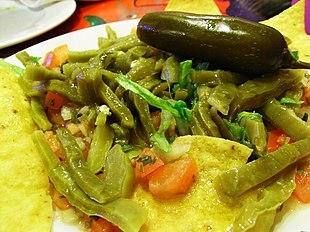 A cactus (plural: cacti, cactuses, or less commonly, cactus)  is a member of the plant family Cactaceae, [Note 1] a family comprising about 127 genera with some 1750 known species of the order Caryophyllales. The word "cactus" derives, through Latin, from the Ancient Greek κάκτος, kaktos, a name originally used by Theophrastus for a spiny plant whose identity is not certain. Cacti occur in a wide range of shapes and sizes. Most cacti live in habitats subject to at least some drought. Many live in extremely dry environments, even being found in the Atacama Desert, one of the driest places on earth. Cacti show many adaptations to conserve water. Almost all cacti are succulents, meaning they have thickened, fleshy parts adapted to store water. Unlike many other succulents, the stem is the only part of most cacti where this vital process takes place. Most species of cacti have lost true leaves, retaining only spines, which are highly modified leaves. 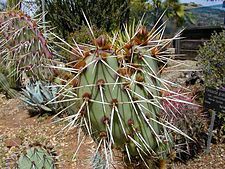 As well as defending against herbivores, spines help prevent water loss by reducing air flow close to the cactus and providing some shade. In the absence of leaves, enlarged stems carry out photosynthesis. Cacti are native to the Americas, ranging from Patagonia in the south to parts of western Canada in the north—except for Rhipsalis baccifera, which also grows in Africa and Sri Lanka. 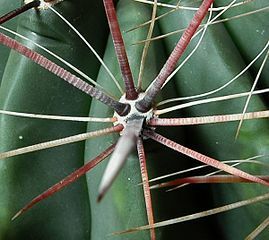 Cactus spines are produced from specialized structures called areoles, a kind of highly reduced branch. Areoles are an identifying feature of cacti. As well as spines, areoles give rise to flowers, which are usually tubular and multipetaled. Many cacti have short growing seasons and long dormancies, and are able to react quickly to any rainfall, helped by an extensive but relatively shallow root system that quickly absorbs any water reaching the ground surface. 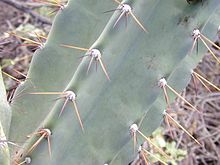 Cactus stems are often ribbed or fluted, which allows them to expand and contract easily for quick water absorption after rain, followed by long drought periods. Like other succulent plants, most cacti employ a special mechanism called " crassulacean acid metabolism" (CAM) as part of photosynthesis. Transpiration, during which carbon dioxide enters the plant and water escapes, does not take place during the day at the same time as photosynthesis, but instead occurs at night. The plant stores the carbon dioxide it takes in as malic acid, retaining it until daylight returns, and only then using it in photosynthesis. Because transpiration takes place during the cooler, more humid night hours, water loss is significantly reduced. Many smaller cacti have globe-shaped stems, combining the highest possible volume for water storage, with the lowest possible surface area for water loss from transpiration. The tallest [Note 2] free-standing cactus is Pachycereus pringlei, with a maximum recorded height of 19.2 m (63 ft),  and the smallest is Blossfeldia liliputiana, only about 1 cm (0.4 in) in diameter at maturity. A fully grown saguaro ( Carnegiea gigantea) is said to be able to absorb as much as 200 U.S. gallons (760 l; 170 imp gal) of water during a rainstorm. A few species differ significantly in appearance from most of the family. At least superficially, plants of the genus Pereskia resemble other trees and shrubs growing around them. They have persistent leaves, and when older, bark-covered stems. Their areoles identify them as cacti, and in spite of their appearance, they, too, have many adaptations for water conservation. Pereskia is considered close to the ancestral species from which all cacti evolved. In tropical regions, other cacti grow as forest climbers and epiphytes (plants that grow on trees). Their stems are typically flattened, almost leaf-like in appearance, with fewer or even no spines, such as the well-known Christmas cactus or Thanksgiving cactus (in the genus Schlumbergera). Areoles are structures unique to cacti. 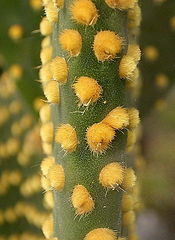 Although variable, they typically appear as woolly or hairy areas on the stems from which spines emerge. Flowers are also produced from areoles. In the genus Pereskia, believed similar to the ancestor of all cacti, the areoles occur in the axils of leaves (i.e. in the angle between the leaf stalk and the stem). 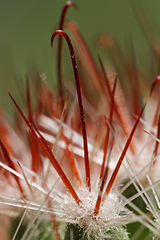 In leafless cacti, areoles are often borne on raised areas on the stem where leaf bases would have been. All cacti have some adaptations to promote efficient water use. 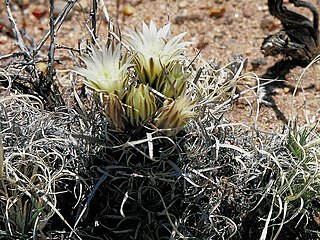 Most cacti—opuntias and cactoids—specialize in surviving in hot and dry environments (i.e. they are xerophytes), but the first ancestors of modern cacti were already adapted to periods of intermittent drought. A small number of cactus species in the tribes Hylocereeae and Rhipsalideae have become adapted to life as climbers or epiphytes, often in tropical forests, where water conservation is less important. The absence of visible leaves is one of the most striking features of most cacti. Pereskia (which is close to the ancestral species from which all cacti evolved) does have long-lasting leaves, which are, however, thickened and succulent in many species. Other species of cactus with long-lasting leaves, such as the opuntioid Pereskiopsis, also have succulent leaves. A key issue in retaining water is the ratio of surface area to volume. Water loss is proportional to surface area, whereas the amount of water present is proportional to volume. Structures with a high surface area-to-volume ratio, such as thin leaves, necessarily lose water at a higher rate than structures with a low area-to-volume ratio, such as thickened stems. Molecular phylogenetic studies have supported the monophyly of three of these subfamilies (not Pereskioideae),   but have not supported all of the tribes or even genera below this level; indeed, a 2011 study found only 39% of the genera in the subfamily Cactoideae sampled in the research were monophyletic. 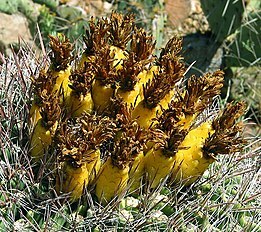 Classification of the cacti currently remains uncertain and is likely to change. Understanding evolution within the core cacti clade is difficult as of February 2012 [update], since phylogenetic relationships are still uncertain and not well related to current classifications. Thus, a 2011 study found "an extraordinarily high proportion of genera" were not monophyletic, so were not all descendants of a single common ancestor. For example, of the 36 genera in the subfamily Cactoideae sampled in the research, 22 (61%) were found not monophyletic. Nine tribes are recognized within Cactoideae in the International Cactaceae Systematics Group (ICSG) classification; one, Calymmantheae, comprises a single genus, Calymmanthium. Only two of the remaining eight – Cacteae and Rhipsalideae – were shown to be monophyletic in a 2011 study by Hernández-Hernández et al. 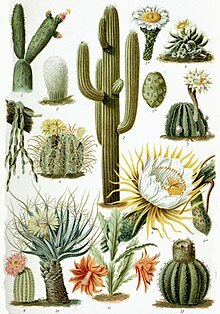 For a more detailed discussion of the phylogeny of the cacti, see Classification of the Cactaceae. Many other species have become naturalized outside the Americas after having been introduced by people, especially in Australia, Hawaii, and the Mediterranean region. 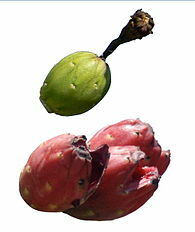 In Australia, species of Opuntia, particularly Opuntia stricta, were introduced in the 19th century for use as natural agricultural fences and in an attempt to establish a cochineal industry. They rapidly became a major weed problem, but are now controlled by biological agents, particularly the moth Cactoblastis cactorum. The weed potential of Opuntia species in Australia continues however, leading to all opuntioid cacti except O. ficus-indica being declared Weeds of National Significance by the Australian Weeds Committee in April 2012. Cacti are often grown in greenhouses, particularly in regions unsuited to the cultivation of cacti outdoors, such the northern parts of Europe and North America. Here, they may be kept in pots or grown in the ground. Cacti are also grown as houseplants, many being tolerant of the often dry atmosphere. Cacti in pots may be placed outside in the summer to ornament gardens or patios, and then kept under cover during the winter. Less drought-resistant epiphytes, such as epiphyllum hybrids, Schlumbergera (the Thanksgiving or Christmas cactus) and Hatiora (the Easter cactus), are widely cultivated as houseplants. The popularity of cacti means many books are devoted to their cultivation. Cacti naturally occur in a wide range of habitats and are then grown in many countries with different climates, so precisely replicating the conditions in which a species normally grows is usually not practical. A broad distinction can be made between semidesert cacti and epiphytic cacti, which need different conditions and are best grown separately. 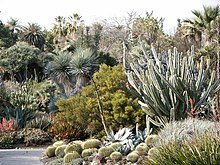 This section is primarily concerned with the cultivation of semidesert cacti in containers and under protection, such as in a greenhouse or in the home, rather than cultivation outside in the ground in those climates that permit it. For the cultivation of epiphytic cacti, see Cultivation of Schlumbergera (Christmas or Thanksgiving cacti), and Cultivation of epiphyllum hybrids. ^ Although the spellings of botanical families have been largely standardized, there is little agreement among botanists as to how these names are to be pronounced. 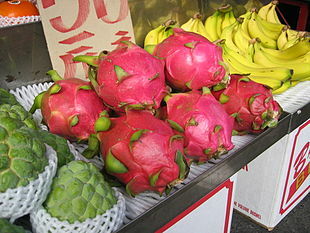 The -aceae suffix can be pronounced /ˈeɪsiiː/ ( AY-see-ee) or /ˈeɪsieɪ/, ( AY-see-ay) or /ˈeɪsi/ ( AY-see). ^ Angiosperm Phylogeny Group (2009). "An update of the Angiosperm Phylogeny Group classification for the orders and families of flowering plants: APG III" (PDF). Botanical Journal of the Linnean Society. 161 (2): 105–121. doi: 10.1111/j.1095-8339.2009.00996.x. Archived from the original on 2013-06-30. Retrieved 2013-07-06. ^ Org, Registry-Migration.Gbif (Feb 14, 2017). "Cactaceae". gbif.org (Data Set). GBIF Secretariat: GBIF Backbone Taxonomy. doi: 10.15468/39omei. Archived from the original on February 19, 2017. Retrieved April 16, 2017. ^ Christenhusz, M. J. M. & Byng, J. W. (2016). "The number of known plants species in the world and its annual increase". Phytotaxa. 261 (3): 201–217. doi: 10.11646/phytotaxa.261.3.1. Archived from the original on 2016-07-29.